“22 But you have come to Mount Zion and to the city of the living God, the heavenly Jerusalem, and to innumerable angels in festal gathering, 23 and to the assembly of the firstborn who are enrolled in heaven, and to God, the judge of all, and to the spirits of the righteous made perfect, 24 and to Jesus, the mediator of a new covenant, and to the sprinkled blood that speaks a better word than the blood of Abel” (Hebrews 12:22-24, ESV). “9 Then came one of the seven angels who had the seven bowls full of the seven last plagues and spoke to me, saying, “Come, I will show you the Bride, the wife of the Lamb.” 10 And he carried me away in the Spirit to a great, high mountain, and showed me the holy city Jerusalem coming down out of heaven from God, 11 having the glory of God, its radiance like a most rare jewel, like a jasper, clear as crystal.” (Revelation 21:9-11, ESV). “25 For the foolishness of God is wiser than men, and the weakness of God is stronger than men. 26 For consider your calling, brothers: not many of you were wise according to worldly standards, not many were powerful, not many were of noble birth. 27 But God chose what is foolish in the world to shame the wise; God chose what is weak in the world to shame the strong; 28 God chose what is low and despised in the world, even things that are not, to bring to nothing things that are, 29 so that no human being might boast in the presence of God. 30 And because of him you are in Christ Jesus, who became to us wisdom from God, righteousness and sanctification and redemption, 31 so that, as it is written, “Let the one who boasts, boast in the Lord” (1 Corinthians 1:25-31, ESV). But owned and loved of God. Church of the Firstborn, hear! It is no name of fear. Are poor in human eyes. Her feeble days are o’er. Born and raised in Edinburgh, Scotland, Horatius Bonar became a pastor at Kelso in 1837 and six years later joining the Free Church of Scotland. His reputation as a religious writer was first gained on the publication of the “Kelso Tracts,” of which he was the author, yet he is no less favorably known as a religious poet and hymn-writer. 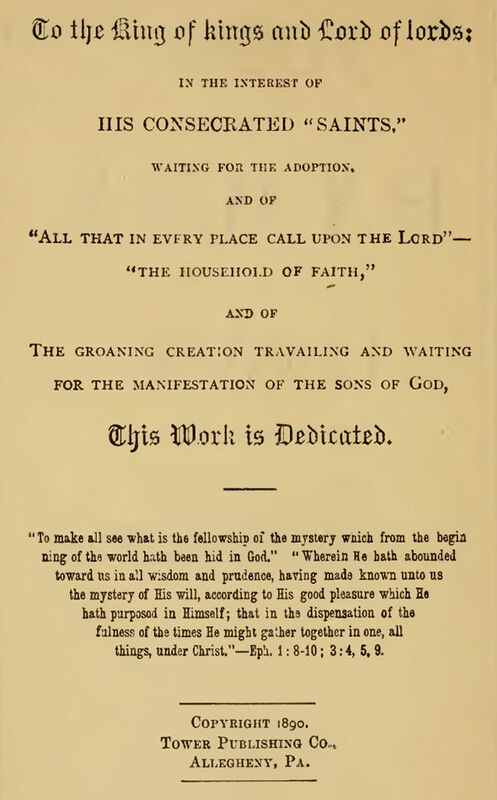 He became editor of the Quarterly Journal of Prophecy in 1848, to which he contributed a hymn for each number and the number of hymns contributed thereto is 101. Composer – No information found in relation to the music score in the Hymns of Dawn for this hymn. Posted on November 1, 2017 August 24, 2018 by Bible Students DailyPosted in Hymns of DawnTagged 1 Corinthians 1:25-31, a little flock, a special calling, Bible Students Daily, called, Charles Taze Russell, Chicago Bible Students, Chief Shepherd, come unto me and rest, crowned, crystal, dawn bible students association, enrolled in heaven, firstborn, foolinshness of God, glory, God the judge, heb, Hebrews 12, Hebrews 12:22-24, holy city jerusalem, Horatius Bonar, hymn 6a, Hymns of Dawn, hymns of dawn no. 6A, I Came To Jesus, I heard the voice of Jesus say, jasper, judge, little flock, Luke 12, Luke 12:29-37, noble, not many great or wise, not many rich or noble, poems and hymns of millennial dawn, poems and hymns of the dawn, rare jewel, reign, religious poet, Revelation 21:9-11, saints, sceptre, seven angels, shepherd, sprinkled blood, stronger, the assembly of the firstborn, weakness, wise. Previous Previous post: Is the “Sabbath day” a Saturday, Sunday or any day of the week? Next Next post: 1 THESSALONIANS 5:16-18 – Prayer – The “Oxygen” for the New Creature in Christ.